The Warren County Health District provides seasonal flu vaccinations each year, generally between October and April. Vaccination clinics are held at the Health Department and various sites throughout the county. Flu vaccines are administered by appointment only. Please call 513-695-1468 schedule an appointment. A Warren County Health District nurse can visit Warren County residents who are homebound and give flu vaccinations in the resident’s home. For this service please call 513-695-1467. 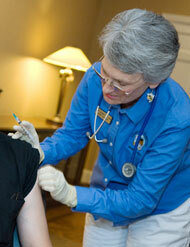 More information on flu vaccinations and schedules of clinics will be provided as the information becomes available. Wash your hands often with soap and water, especially after you cough or sneeze and before eating. Alcohol-based hand cleaners are also effective. If you get sick with influenza, stay home from work or school and limit contact with others to keep from infecting them. Avoid touching your eyes, nose or mouth. Contact your medical provider if symptoms become severe or worsen. Additional information about influenza and the flu vaccine may be found at the Centers for Disease Control. Be sure to visit this page often to stay up to date on any clinics or changes. You can also fill out and print the Flu Vaccine Administration Form, located under Documents, before you come to see us.